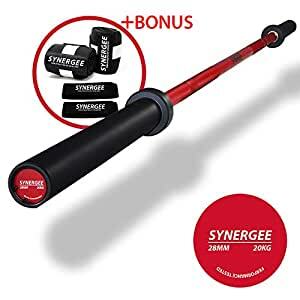 HIGH QUALITY – Built to last, Synergee Olympic Barbells are made from high grade material, perfect for weightlifting, Olympic weightlifting, powerlifting and more. EFFICIENT PERFORMANCE â This bar will have normal âwhipâ during weightlifting exercises and enough stiffness for heavy powerlifting. With a tensile strength of 190,000 PSI and a total of 8 bearings, this bar is perfect to bring your workout to the next level. INTENSIFY YOUR WORKOUT â With a loadable sleeve length of 16.25 inches, our barbell can carry loads of extra weight, helping you reach your potential. Customize your weight load for deadlifts, push press, squats, bench press and more! ALL AROUND PROTECTION – Buy with confidence knowing that no matter what, we’ve got your back! We offer a better than money back guarantee, if there is an issue with your product for any reason we will refund you and send you a new one absolutely FREE! We stand by our products and only manufacture the absolute BEST!